Popular known as cascara, coffee fruit is the cherry-like fruit surrounding the coffee bean. After the beans are extracted, this fruit is typically wasted. 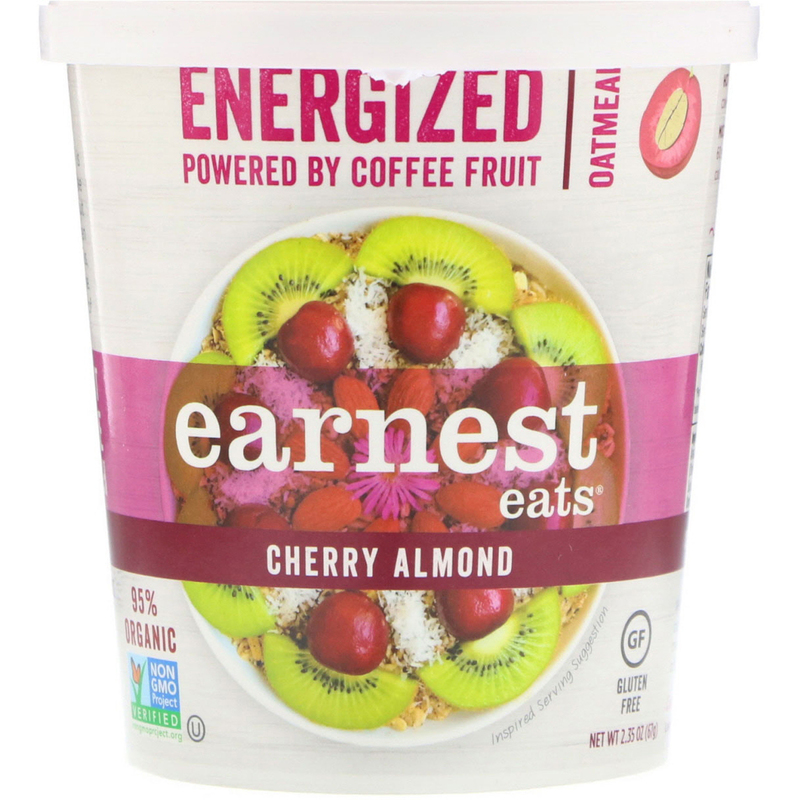 We're using this hidden treasure to make your oatmeal nutritious, antioxidant-rich, with a natural hint of caffeine, consider your breakfast a double dose of superfood goodness. 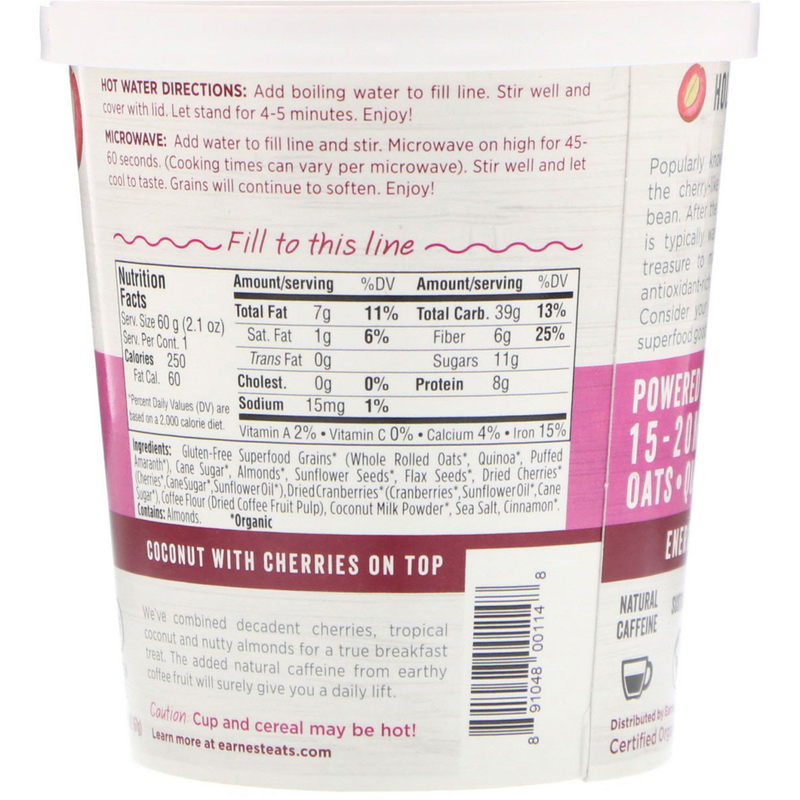 We've combined decadent cherries, tropical coconut and nutty almonds for true breakfast treat. The added natural caffeine from earthy coffee fruit will surely give you a daily lift. Add boiling water to fill line. Stir well and cover with lid. Let stand for 4-5 minutes. Enjoy. Add water to fill line and stir. Microwave on high for 45-60 seconds. (Cooking times can vary per microwave). Stir well and let cool to taste. Grains will continue to soften. Enjoy! Gluten free superfood grains* (whole rolled oats*, quinoa*, puffed amaranth*), cane sugar*, almonds*, sunflower seeds*, flax seeds*, dried cherries* (cherries*, cane sugar*, sunflower oil*), dried cranberries*, sunflower oil*, cane sugar*), coffee flour (dried coffee fruit pulp), coconut milk powder*, sea salt, cinnamon*. Caution: Cup and cereal may be hot.